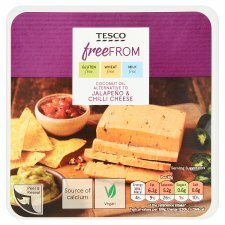 Gluten free coconut oil and oat fibre alternative to Cheddar cheese with jalapeño and chilli, enriched with calcium. Water, Coconut Oil (20%), Modified Potato Starch, Maize Starch, Oat Fibre, Thickeners (Carrageenan, Guar Gum), Modified Maize Starch, Sugar, Tomato, Salt, Spirit Vinegar, Flavourings, Tricalcium Citrate, Yeast Extract, Jalapeño Chilli, Acidity Regulators (Lactic Acid, Sodium Lactate), Red Pepper, Chilli, Colours (Paprika Extract, Mixed Carotenes), Sultanas, Garlic, Tomato Purée, Dried Apple, Dried Onion, Ginger, Pimento, Garlic Powder. Keep refrigerated. Once opened, consume within 10 days and by date shown.